Timo Garden is an organic garden in middle Sweden not far from Stockholm. It is situated in an area considered to be zone 2 or 3 with pockets of zone 1 micro climate. We have a very heavy clay soil lightened up with the use of large amounts of compost and mulch. We grow all the typical swedish vegetables, some american and some japanese vegetables, as well as fruit, nuts and berries. A large part of the garden is occupied by permaculture experimentation where we grow green manure, bushes and trees as wind breaks and shade, etc, and flowers and plants as ornamentals and to attract the birds and the bees and the butterflies. We save a lot of our produce for the winter but are not self sufficient. We also process much of the harvest in the form of pickles, sauerkraut and preserves. We have studied oriental food processing and regularly make koji and miso too. Being this far north we have a rather short growing season and start most of our vegetable plants indoors for outdoor planting in the end of may. The growing season lasts until about the end of August when the first frosts can come, but often they come later. September is when most of the harvesting is done, although some kales and onions, etc can survive the cold until around new year. This gives us a long winter season which is dedicated to soil building, landscaping, garden art, study and rest. 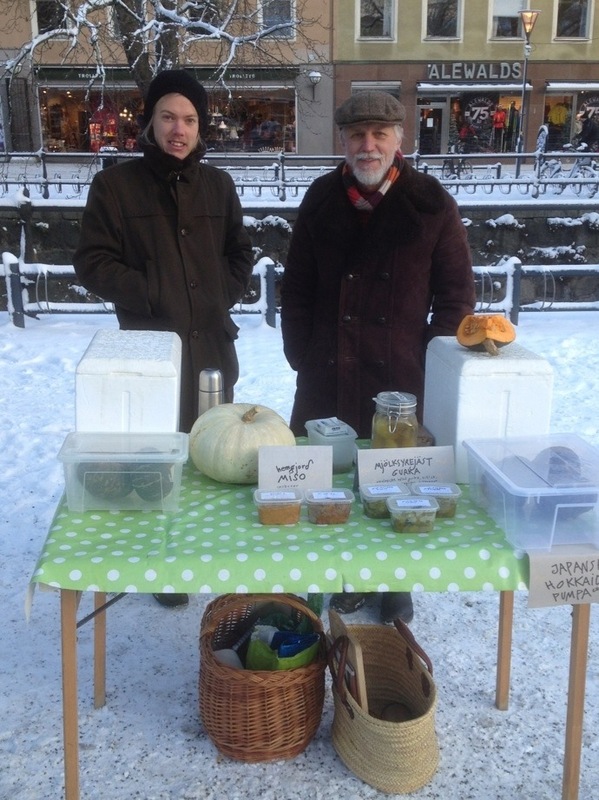 Joel and I at the Fyristorg Farmers Market in Uppsala on 1 december 2012 selling pumpkins, miso, sauerkraut and pickles. 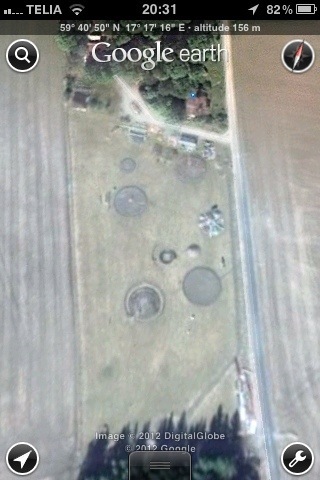 Timo Garden as seen from outer space. thanks for the inspiration! can one come by to visit the garden? Of course, if you’re in the neighborhood. Hey, you mention you have nut trees,,, what nuts can you grow in your climate? I’m in a cold part of Canada, similar zone, and it would be nice to grow nuts here. I have some indigenous hazel (Corylus avellana) and a few walnuts of a type called siberian or manchurian walnut (juglans mandshurica). They are still small trees and not producing any nuts as yet, so I don’t know if the latter are any good for eating. The hazelnuts should be good if I can beat the squrrels. Thanks for stopping by my blog and liking a recent post. I hope you would like an award because I am about to nominate your AWESOME blog! Please email me at belmontrooster@centurylink.net. You have a great blog! You do so much with a shorter growing season. I will be reading more and getting inspiration from you. Yes, we have to be resourceful with early starters, late crops, cold and warm frames, greenhouses etc. But winter is also a nice restful period of contemplation and planning. You are right, that is a good way to think of the Winter period. I almost feel guilty for my lack of action but I’m going to adopt your attitude! GREAT BLOG!!! Keep up the good work! Thanks for liking my recent post and now following my blog! I hope you continue to enjoy. Thanks for stopping by my blog. You asked where I am in Sweden. I asked where you were and I have just found out. You are right here in Sweden! I like what you are doing growing Swedish grönsaker. Welcome back to my blog anytime! Cool! We made yogurt, cheese and mesost. But we kinda overdosed on it. I’ll be keeping an eye on your blog for sure.